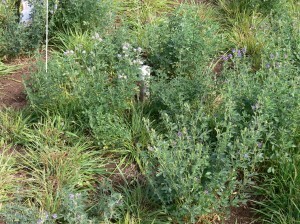 Lucerne is the most widely sown and adapted perennial legume on the Northern Slopes of NSW, but has fallen from favour in recent years. 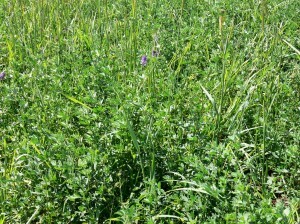 One reason for lucerne’s decline is its potential when grazed for low ground cover and associated high risk of surface runoff and erosion. Lucerne’s poor performances in variable rainfall years, low growth in winter, and potential for bloat in cattle are also issues. In this study, a series of field experiments (Table 1) was conducted on a Brown Vertosol soil at Tamworth Agricultural Institute from Spring 2008 to Spring 2012 to investigate competition among seedlings, sowing (configuration, time and rate), persistence (plant frequency), herbage production, soil water content and water use efficiency, ground cover and control of surface runoff and erosion of lucerne-grass mixes. 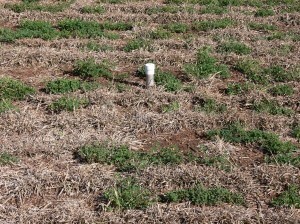 Full details of the study, including results and further information about sowing lucerne in mixes can be found in the Tamworth Proof Site key message: Lucerne-grass mixtures outperform pure grass pastures on the North West Slopes of NSW. 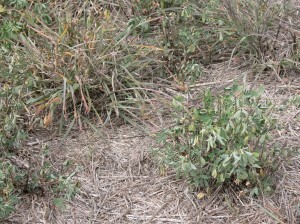 Lucerne and Premier digit mixtures in autumn, winter, spring and summer (clockwise from top left) demonstrating water stress in autumn, low growth in winter and strong growth through the warm season.